Laminitis or inflammation of the equine hoof is a serious condition. In its acute presentation, prompt aggressive treatment aimed at relieving the inflammation and removing the predisposing cause will prevent any permanent damage to the foot. The chronic laminitis case unfortunately presents more of a challenge. Most chronic laminitis cases present with some degree of coffin bone rotation, multiple symptoms of metabolic imbalance, and no obvious predisposing causes. These horses are systemically ill and require diligent ongoing care to fully recover. 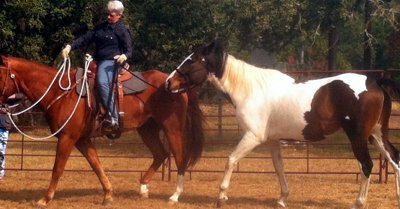 In my practice I have two main types of horses that present with recurrent or chronic laminitis. I think of them as hypothyroid or pituitary types, although I do not find lab tests to consistently support actual glandular dysfunction. Some horses have symptoms of both categories. It is helpful for me, however, to attempt to determine which type I am dealing with when forming a treatment plan and attempting to give a prognosis to the owner. The hypothyroid laminitis horses are almost always overweight. They are easy keepers and will have aggravations in their symptoms if they get even small amounts of grain or fresh green grass. Their fat is fairly evenly distributed over the body with pons over the withers and tail head. They can have dull haircoats or other hypothyroid symptoms, but often appear overall to be healthy, happy, well adjusted horses with the exception of their laminitis. These horses usually respond well to management changes and treatment to address their hypothyroidism. The pituitary type horses are usually normal weight to thin and won’t get overweight unless overfed. If they do have extra fat, it is mainly in the crest area of the neck and is very hard. There may be an obvious dip in front of the withers and the entire body can be tight and stiff. They can have thick haircoats even in the summer. When these horses first start to have trouble they may walk like a foundered horse but have no reaction to hoof testers. I think the early pain comes from contracted muscles and tendons, but left untreated serious laminar damage can develop. Clinical signs – Typical stiff walking-on-egg-shells gait or refusal to move. Reaction to hoof tester at toe. Increased digital pulse. Radiographic findings – Distance from front of coffin bone to hoof wall of greater than 17 mm. and coffin bone rotation. Basic profile and T4 for baseline. History – Very important – diet, housing, shoeing, use, medications and vaccinations. Leave shoes on until soreness is out of feet unless toes are excessively long. Long toes put more pressure on the deep digital flexor tendon and encourage coffin bone rotation. Put frog supports on making sure the tip of the frog support is 3/8″ behind the tip of the frog. No part of the support should contact the sole. Theraflex pads can be used temporarily and they are easy to tape on. Lilly pads do not give as much support, but can sometimes be slipped under the foot and taped in place if the horse is too painful to pick up the foot. Always start with the most painful foot as it will be easier to pick up and may be more comfortable after the frog support is in place. Occasionally a horse will be worse with even the slightest frog support. These horses often have excessive swelling in the lamina or painful abscesses. In this case remove the frog support and try taping on wedge pads to raise the heels and take pressure off the tendons. If radiographs reveal severe swelling or abscesses, a partial resection should be done immediately to open abscesses and relieve pressure. I do this by carefully rasping the front of the hoof until I reach sensitive tissue. This procedure can be done on a standing horse with no sedative or nerve blocks if one is careful. The resection will grow out in four to six months, but if not performed early laminar attachments may be already destroyed. If the horse responded well to frog supports, I use a heart bar shoe or a shoe with a Theraflex pad for at least one shoeing period. If contracted tendons are the main problem then wedge pads are used to raise the heels. A reverse shoe may suffice if the tendon tightening is mild. I always shorten the toe to ease breakover. I rarely if ever lower heels. Shoeing must be done by a competent farrier that has worked before with foundered horses. These horses have special needs which may require beveling the inside shoe rim to protect the sole and clips to take pressure off the nails and hoof wall. The shoeing interval must be regular and tailored to the horses needs. Amazingly, owners will spend thousands of dollars to save a foundered horse but neglect hoof care after the crisis is past. As with all chronic diseases there is no one remedy for laminitis. One must find the constitutional remedy or at least the one that best fits the individual case. For treatment of the inflammation I use acute type remedies. Belladonna – There may be a pounding pulse, dilated pupils and heat in the feet. I give 200c – 1m one to three times a day. Aconite – Similar to Belladonna but more frantic and fearful. Again I use 200c – 1m one to three times a day. Arnica – These horses are much less dramatic. They mainly act stiff and sore with an elevated but not pounding digital pulse. Again 200c – 1 m one to three times daily. Apis – There is extreme swelling of the lower legs. These horses are thirstless and worse from heat. I give 30c – 200c one to three times a day. Nux Vomica – I use Nux when symptoms develop after overeating green grass, feed or heavily fertilized hay. I give 30c once an hour for four doses. I usually wait seven to ten days before trying to prescribe constitutionally unless I see a clear picture sooner. This gives me time to observe the horse and collect the information I need to make a good prescription. Thuja – This is a good place to start, especially if there is a history of recent vaccination. These horses may be very fat in the body but have thin legs. Calc Carb – These horses can be slow, pushy, and even somewhat stubborn but generally are quite friendly. I think of Calc Carb if Belladonna was given successfully for early symptoms. Sulphur – These horses are much more energetic than those requiring Calc Carb. They have a strong personality and expect to get their own way. Graphites – These horses have very thick walled boxy feet. They are very wise but not real outgoing. Their coronary bands are often unlevel which may contribute to lameness. Look for poorly healed scars. Silicea – These are very sensitive horses that do not handle pain well. Abscesses are often a big problem. They do not handle heat well and hate any kind of injection. Nat Sulph – These horses also have a history of vaccination. They are very tense and tight in the body. Arsenicum – These horses may have very poor quality hooves with diseased frogs. Their heels are often underrun and they have a tendency to get thrush. Phosphorous – Similar to Ars. but more thirsty. They may have glucose in the urine. Gastric ulcers may be a problem (also consider Lycopodium). Rhus Tox – Tendon contraction is very prominent in these cases. They tend to stand long periods of time in the same place, but if forced to move will improve. I treat using the classical approach of one remedy at a time, changing potencies and remedies as the case progresses. Both of these modalities are beneficial in returning the body to a state of balance. Chiropractic is complementary to homeopathy, but it is best to choose between acupuncture and homeopathy, rather than use both concurrently. Take horses off high carbohydrate rations. Use a minimum of drugs including insecticides. Do not allow access to highly fertilized hays or pasture. Provide fresh, clean, non-chlorinated water. Provide a good quality broad spectrum vitamin and mineral supplement that is easily absorbed and assimilated by the body. Try not to overstress the horse. Always be on the lookout for early signs of laminitis. It is a disease which is easier to prevent than treat. Once symptoms appear, one should approach the case as a systemic illness that will require long term care. The American Association of Equine Practitioners met in New Orleans the end of Nov.2003. I was able to attend this meeting and it was packed with useful information. The most meaningful to me was the 4.5 hour lecture by Dr. Chris Pollitt on the pathogenesis of laminitis. Dr. Pollitt has dedicated all of his efforts to discovering the mechanism behind laminitis so it can be prevented. He works out of the Australian Equine Laminitis Unit at eh School of Veterinary Medicine at the University of Queensland. In order to study the pathology of laminitis, Dr. Pollitt has spent a great deal of time studying the normal growth patterns of the hoof. He has discovered that the in addition to the cells of the hoof generating from the coronet, new hoof cells are also formed at the level of the tips of the primary epidural lamina in the upper portion of the hoof. There is no evidence of cell proliferation at the laminar level of the distal portion of the hoof. The fundamental problem of how the inner hoof wall lamellae remain attached to the connective tissue embedded on the surface of the stationary distal phalanx(coffin bone) while one moves over the other is unresolved. A 20-fold decrease between the upper and lower lamellae suggests that the majority of the normal lamellae do not produce hoof wall and their main function is to suspend the distal phalanx within the hoof wall. Research suggests that in order for the new hoof wall generated at the upper part of the hoof to slide down over the stationary tissue of the lower hoof the laminar cells must be continually detaching and reattaching. The process which allows this to happen involves the controlled release of matrix metalloproteinases and their subsequent inhibition by tissue inhibitors of metalloproteinases. Dr. Pollitt&Mac226;s research suggest that it is this normal process of continual destruction and reorganization of cells at the level of the basement membrane in the lamina that goes horribly wrong in the case of laminitis. His research suggests one mechanism for laminitis involves the ingestion of grass containing high levels of fructans. Pasture grasses produce oligofructose under certain climate conditions such as following rain or frost. Mammals have no enzymes to metabolize these fructans so they pass undigested into the caecum where they undergo rapid microbial fermentation. When this occurs, Gram positive organisms, notably Streptococcus bovis and S. equinus, proliferate and temporarily become the dominant flora. The large gram positive bacterial population could liberate toxins when they die off at the end of their growth phase or when the fructan substrate is exhausted. These toxins then penetrate the gut wall into the blood stream and trigger the release of metalloproteinases. The excess release of metalloproteinases causes widespread destruction of the laminar tissues in the hoof. If Dr. Pollitts research is correct then one of our best preventive measures for laminitis is to limit pasture access during conditions where fructans are likely to be elevated in the grasses. His research can also help us look for ways to limit the fermentation of fructans in the hindgut. Once the lamina have been destroyed treatment is often ineffective so focus on prevention of laminitis is extremely important.